Wound sealant for sealing around the perimeter of small to large cuts and along the edges of Jins and Sharis. For grafting work or anywhere that the bark has been opened up to the air, which can cause disease and drying out of the area of the wound causing die back. Apply it to seal off cuts and also keep sap from bleeding. Reduce dieback and or death to the tree to about nil. Long storage stability of more than 10 years at ambient temperature. There are no batch to batch variations in colour density and shade. Besides, Viscosity or rather Rheology remain the same. product has dried out and in most trees promote new growth on cut branches. Contains substances that promote bark and root growth, and keep fungus and germs away. Unlike the Japanese Cut Paste products, you do not require to wet your fingers. Contaminated area on the skins washes off readily with tap water. 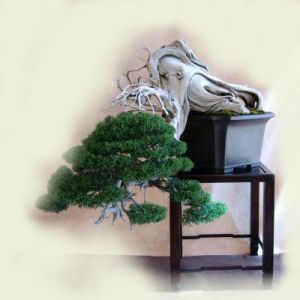 Although the products engineered for Bonsai trees, but in general, they could also be used for delicate, ornamental and non-bonsai trees. Bonzmend products are approved and recommended by the Federation of British Bonsai Societies.